This furniture collection brings the appeal of white painted furniture with contrasting OAK TOP for a true twist on country style. 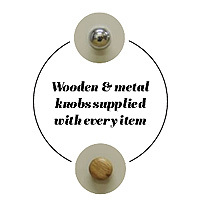 Choose from metal or oak wood knobs supplied with every piece. This range is spread over two pages. See Navigation at base of this page.